For 13 animals left vegetating for months - even years - in the bombed out Magic World Zoo, FOUR PAWS came to their rescue. Dr. Amir Khalil, FOUR PAWS vet and long-time expert of animal rescue operations in war and conflict zones, heard about the dismal fate of these animals. For him one thing was clear: he would do everything to save the remaining animals from certain death. Months of preparation culminated in one of the most strenuous and logistically challenging rescue operations ever carried out by FOUR PAWS but now each animal is able to recover in sanctuaries for the rest of their lives. and would not have had. The mission to free the remaining 13 animals took place in not one, but TWO harrowing missions. In July 2017, the first team of experts set out to rescue 13 starved and severly dehydrated animals from the Magic World Zoo. FOUR PAWS worked alongside local government and security experts in Turkey and Syria to safely transport the first nine animals to Turkey. Three lions (two females and a male), two tigers (a female and a male), two Asian black bears (a female and a male) and two hyenas were among the first survivors. 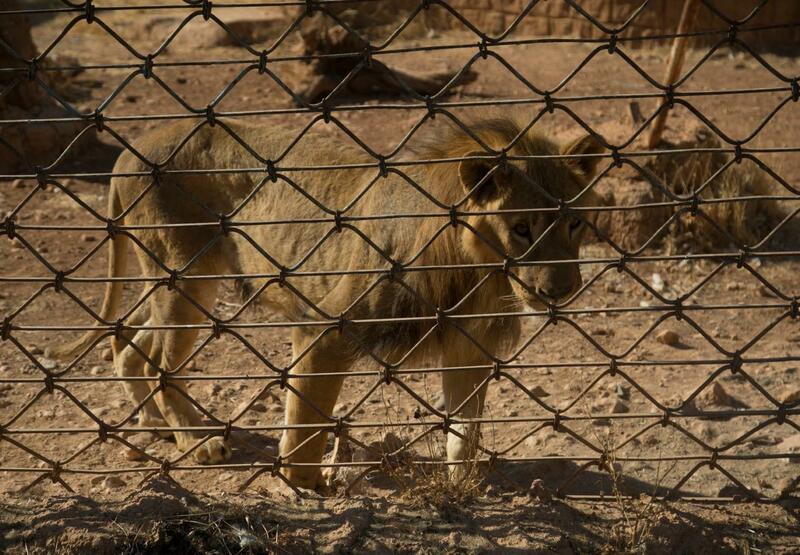 The remaining four animals - two lions and two dogs - were brought to safety several days later. But the rescue wasn't without its milestones. Gunfire and explosions could be heard in the distance while the team worked. 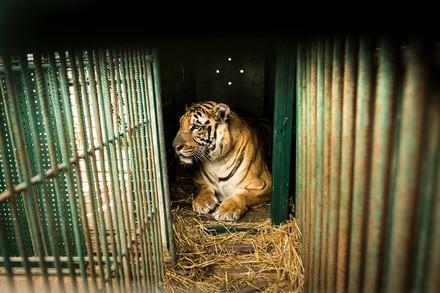 On the journey to freedom, one of the tigers had a heart attack and had to be brought back to life by Dr. Frank Göritz, the chief vet at the Leibniz Institute for Zoo and Wildlife Research (IZW) in Berlin and a long-standing FOUR PAWS partner. In a routine ultrasound, a female lion showed she was pregnant. These incidents provided extreme pressure for the team to work quickly and efficiently to bring the animals to safety. The FOUR PAWS team monitored them closely throughout transport and while the animals were in quarantine in order to quickly pick up on any signs of duress. After the animals were evacuated, they were brought to a temporary home at our partner sanctuary, Al Ma'Wa for Nature and Wildlife. Once there, Dana, the female lion, gave birth to a lion cub: Hajar. Unfortunately, the little cub passed away after one month, another victim of the Syrian War Crisis. We owe a big thanks to the Turkish authorities who, twice, opened the border and allowed our team to safely pass with the 13 animals. We also thank our partner organizations and team members for bravely saving each of the 13 lives. Now these animals will find peace and be given a second chance at life.